A labyrinth of equestrian and hiking trails crisscross mystical Pebble Beach. More than 27 miles of this amazing maze spiral through the enchanting Del Monte Forest, unveiling intimate hikes through nature, relaxing boardwalk strolls along the inspiring coast, and of course, long walks on some of the most beautiful beaches you will find. A soft and sandy beach trail emerges from behind the 14th hole at Spanish Bay, snaking through stunning sand dunes before evolving into a beautiful boardwalk overlooking Moss Beach. Cruise along the boardwalk for 1.5 miles, where you’ll curl around South Moss Beach, and connect to footpaths skirting the Dunes Course at Monterey Peninsula Country Club. You’ll soon reach powerful Point Joe and the Restless Sea. If you’ve got another 2 miles in you, soak in some of the most spectacular coastline 17-Mile Drive offers. Wind past China Rock and follow the barking sea lions to the marine wildlife hub known as Bird Rock. And if you’re looking for a little more solitude, you’ll find a quiet beach at Seal Rock, which neighbors the panoramic Fanshell Beach. This 86-acre wooded oasis swerves through groves of coast live oak, Bishop pine, Monterey pine, Monterey cypress, a pygmy forest of Gowen cypress, and creekside redwoods. A family-friendly loop, the undulating Botanical Reserve is a remote escape behind the forest holes on the Dunes Course at M.P.C.C. and the back nine of Poppy Hills Golf Course. And at times, it will make you feel like you’ve unlocked a secret level in Super Mario World. A creekside hiking trail starts at Congress Road, connecting to trails and fire roads in the Huckleberry Hill Natural Habitat Area — which rises some 800 feet above sea level. Follow the sun and wander down a short boardwalk from the fire pits at Spanish Bay to the middle of Moss Beach. A right turn takes you to North Moss Beach, along the 17th hole at Spanish Bay, and out toward Asilomar State Beach. A left turn sets you free on South Moss Beach, and out to Point Joe and beyond, if you wish. A simple stroll around the third hole at Pebble Beach Golf Links leads you to the Stillwater Cove Yacht Harbor, and a sunken beach below the fourth and 17th greens. If the tide is low enough, you can even walk below the fifth hole, and enjoy a unique perspective of the mountainous sixth hole and Arrowhead Point. 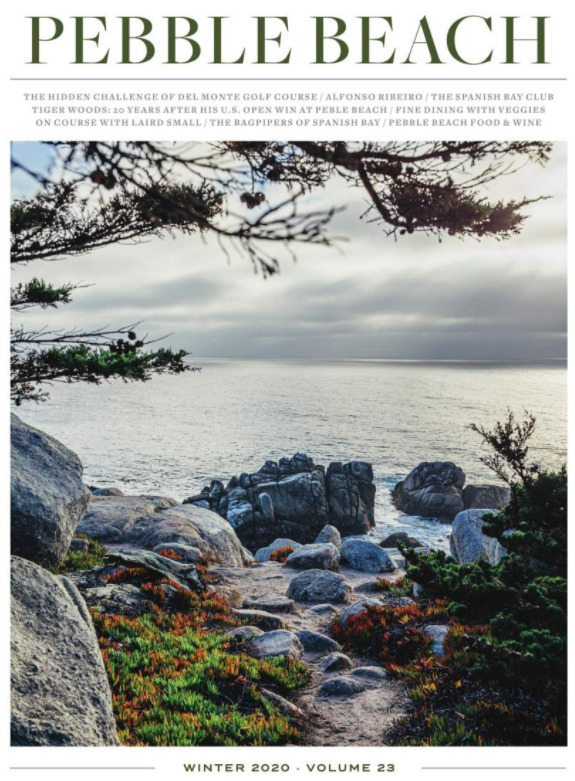 If you’re itching to channel Lewis and Clark, there is the ambitious Carmel Bay to Spanish Bay trail — a 12-mile round-trip with some choose-your-own-adventure and road-less-traveled forks in the road. Or you could adapt this creative 7-mile hike invented by a travel writer for the LA Times. Or you can click on the map above and start charting your own trail!